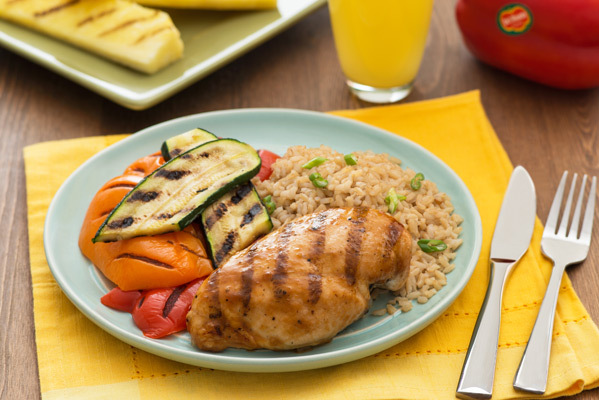 This easy glaze with Del Monte® Pure Earth™ 100% Pineapple Juice adds bright and zingy flavors to everyday barbecued chicken. Preheat grill to medium heat; grease grill well. Toss chicken breast with oil, salt and pepper. Pineapple Ginger Glaze: Combine pineapple juice, vinegar, brown sugar, soy sauce, ginger and mustard in a medium saucepan set over medium-high heat. Bring to a boil; boil for about 15 minutes or until reduced by half. Grill chicken, for 2 minutes per side or until grill-marked. Continue to grill, basting and turning with Pineapple Ginger Glaze, for 5 to 6 minutes or until cooked through. Grill zucchini, red pepper, orange pepper and pineapple spears, basting with Pineapple Ginger Glaze, for 3 to 5 minutes or until grill-marked and tender. Serve chicken with vegetables and pineapple. Garnish with green onions. Tip: Serve over steamed brown rice.